Bright integrated lights help you see at night and keep you visible in traffic, two battery size options help you go further, extra safety fuses and temperature monitoring for the battery with five year warranty! Maxxis Gypsy, 26" x 2.1"
The Electric Bike Company only really makes two ebikes… and they are basically two versions of the same powerful cruiser. There’s a step-thru (which they call the Model S) and a cantilever high-step (which they call the Model C). 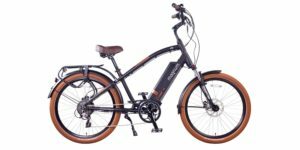 Both models only come in one frame size, and they leverage the same powerful hub motor and rear-rack battery, but you do get two battery capacity choices, along with several classy colorways. Why only make two models? The founder, Sean Lupton-Smith, explained that when he launched the company back in 2013, he wanted to make the best cruiser possible while still maintaining a reasonable price point, and then focus in on accessories and upgrades that worked seamlessly. 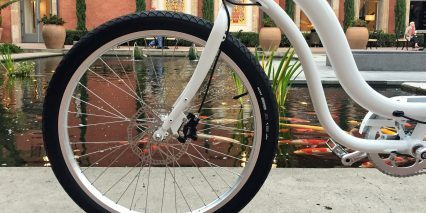 You can see that with their optional color matched steel fenders, front basket, and suspension seat post. The little details definitely add up! 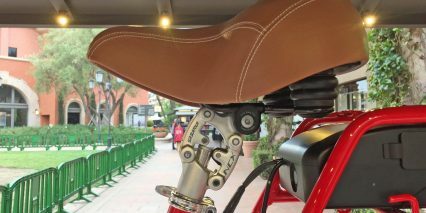 I noticed the matching leather grips and saddle visually but also appreciated that the grips have two locking rings and the saddle is actually comfortable and forgiving with rubber bumpers below. 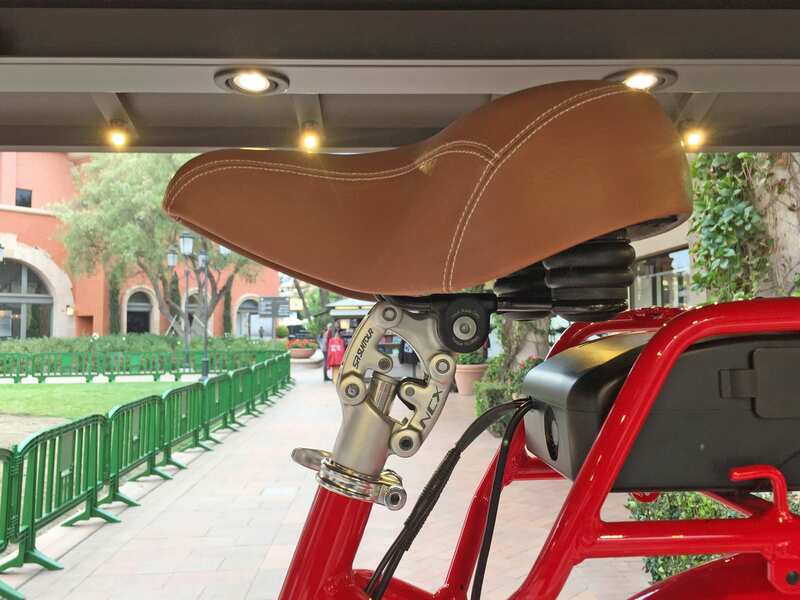 Everything is branded… you see the Electric Bike Company logo on the display, the grips, the saddle… and I don’t really care about that, but it does communicate an attention to detail and customization that other brands seem to disregard or compromise on. Notice how all of the metal parts are silver? 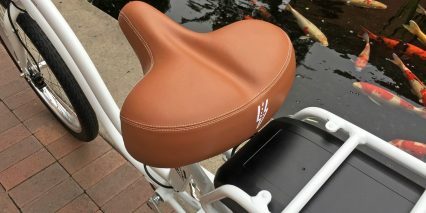 Even the optional suspension seat post from SR Suntour. 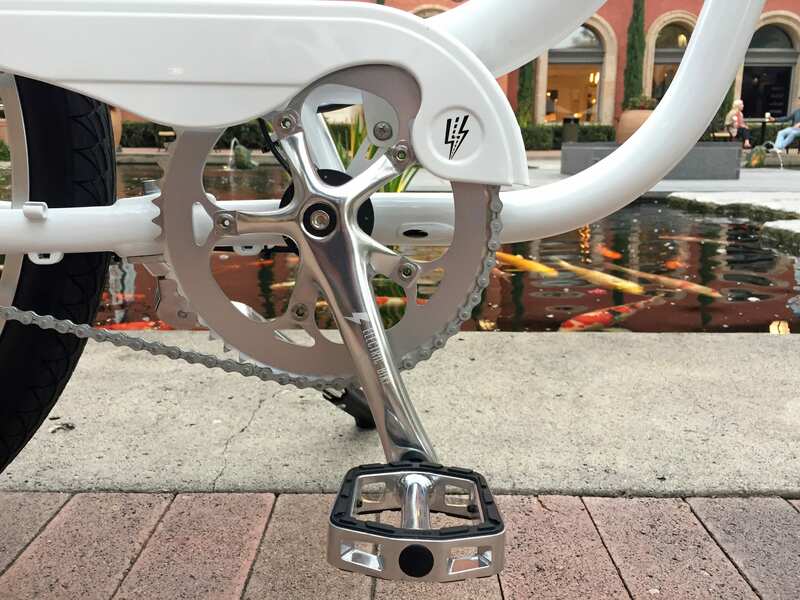 And these are not bottom-of-the-barrel components either, the pedals were chosen for performance as well as aesthetic and safety while the adjustable stem aims to accommodate riders of different heights. 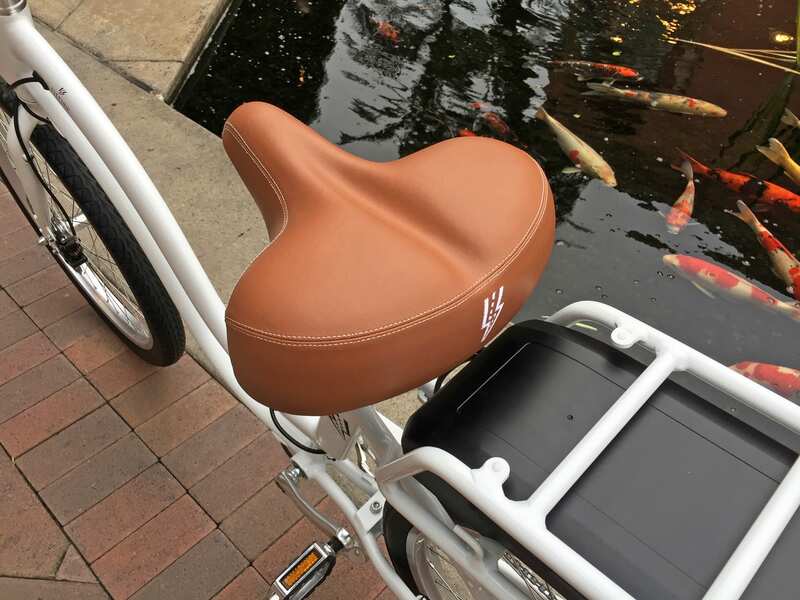 Even the way the saddle can go all the way down without hitting the rear rack, to allow for a more stable and confident ride for those with shorter inseams. I don’t mean to gush too much here, it’s just worth noting that these guys really seem to care. 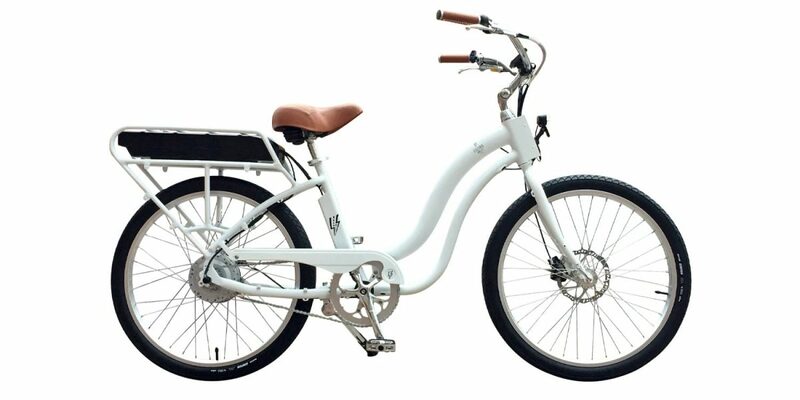 You can see that in their outstanding 5-year warranty, individually fused battery cells, unique integrated charger, high-quality front basket with light mount, e-bike specific puncture resistant tires, slimed inner tubes, and international shipping. None of that comes for free, but the sub-$2k price point is very reasonable for such a powerful, beautiful product. The one thing you really don’t get here, is gears. 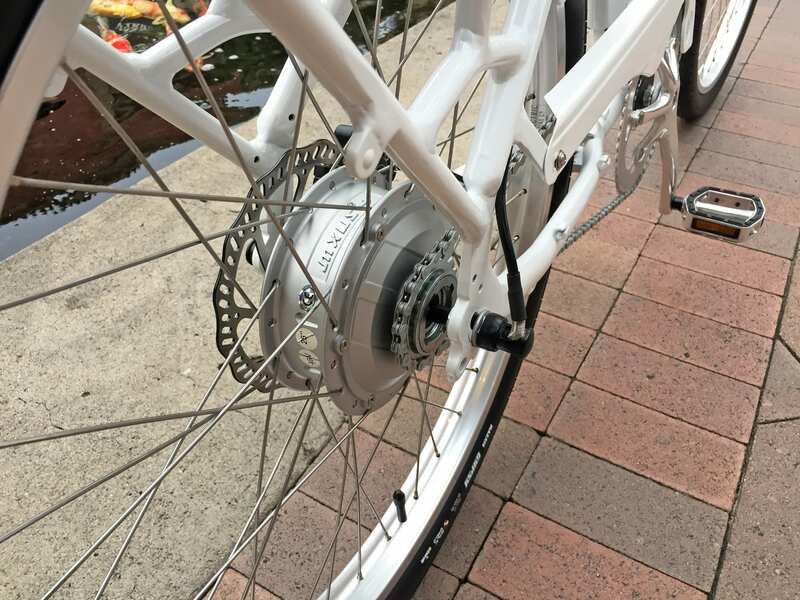 This is a single-speed electric bicycle with the option to add your own derailleur post-purchase. 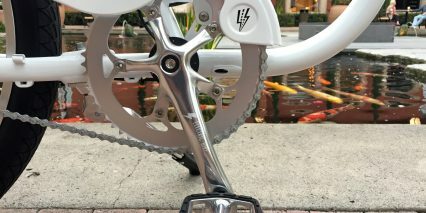 The company does offer two rear sprocket choices, 16 tooth for comfortable high-speed riding or 18-tooth for easier starts and slower riding. With only one gear, the chain stays tight and on track, there’s less grease, less chain slap and noise, less weight, and a cleaner-simpler handlebar. 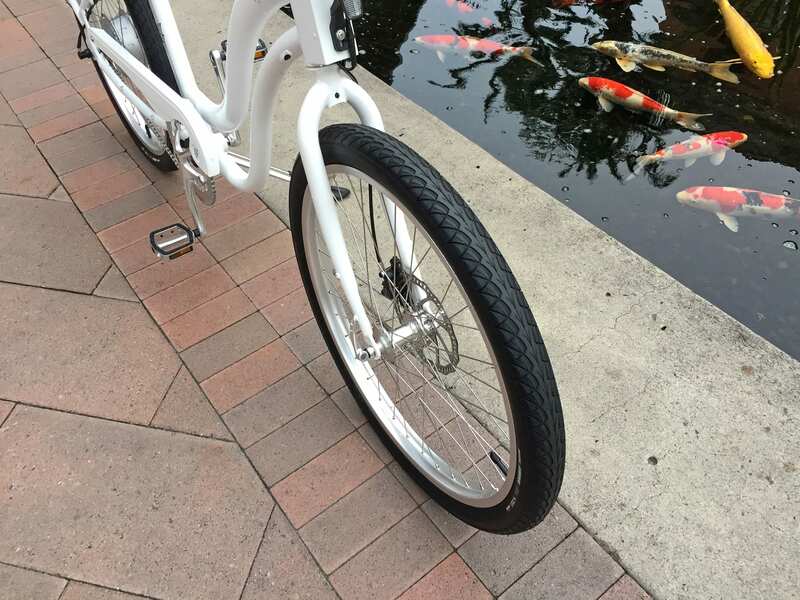 Without the fenders, this ebike weighs about 60 lbs (27 kg), which is not super light… but the double-tube design keeps it stable and can support loads up to 360 lbs (163 kg) which is way above average. Most competing products advertise support for up to 250 lbs (113 kb). There’s more to explore below, I haven’t even talked about motor performance, there’s just a lot of little details to appreciate with this bike and from this company. 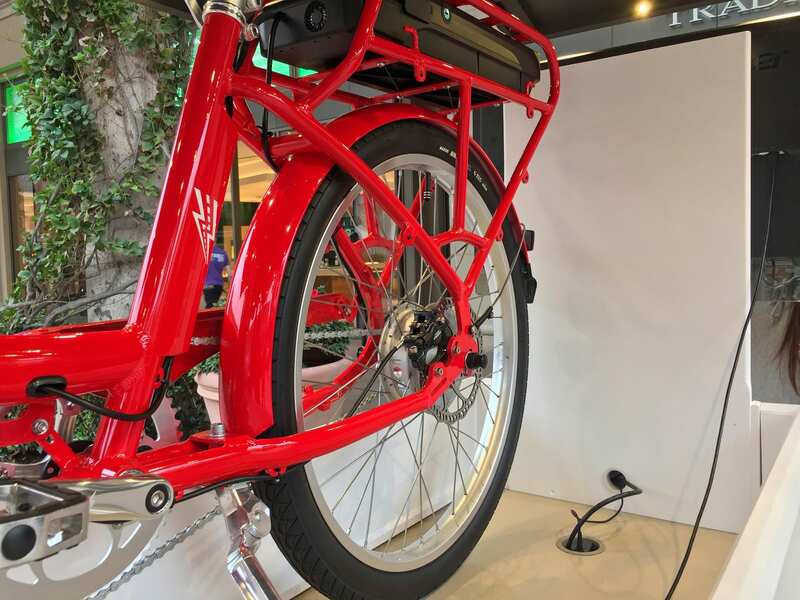 Which, by the way, has launched an ebike chain in Africa to empower efficient sustainable transport and built entrepreneurial opportunities for local business people. How cool is that! 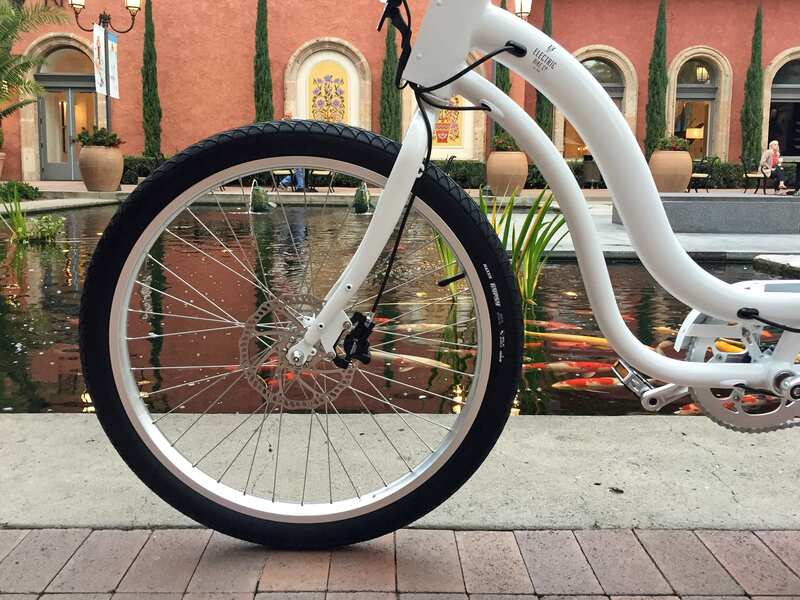 Driving this bike is a planetary geared hub motor rated at 500 watt nominal and 1,280 watt peak. They didn’t provide a Newton meter torque rating, but I’m guessing it would be in the 50 to 60 Nm range because it feels VERY powerful. The Model S and C are both speed pedelecs, meaning that they can be pedaled up to ~28 mph with motor support. You can definitely lower that top speed by entering into the settings menu of the display (discussed later on), and the throttle will only ever support up to 20 mph for legal reasons. Being geared, the motor is compact and lightweight, but it does produce more zipping noises under full operation. I reached ~25 mph when testing on a limited stretch of road at a mall in Southern California called Fashion Island. 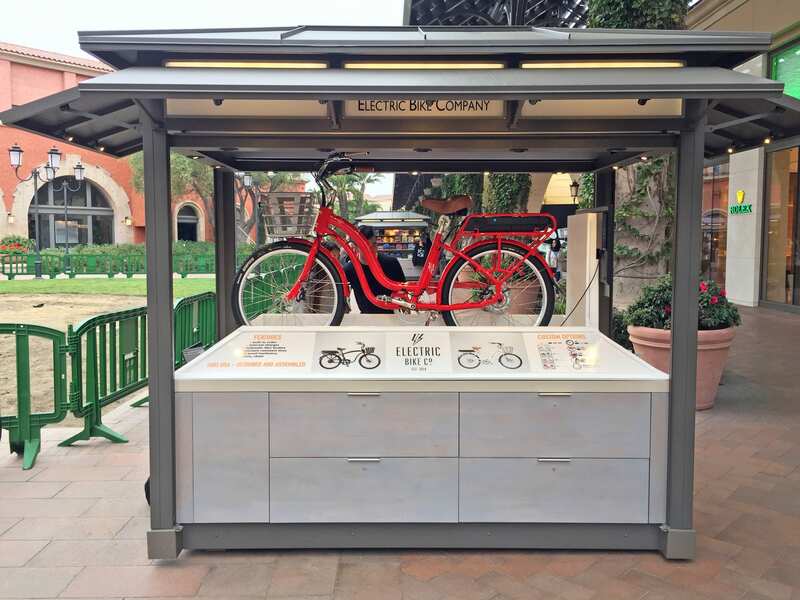 This is one of the pop-up locations that the company has been using to conduct demos and sell their product in person. For most of the rest of us, you can order online… and that comes with a bit of added cost. 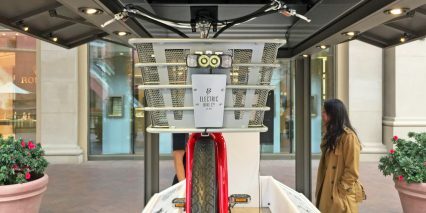 The flat-rate shipping for the USA is $225, but Electric Bike Company also sells to Canada and will work with international companies. This is where the shipping price can really start to rise. The good news is, I am told that the bikes come fully assembled and nearly ready to ride (I’m guessing that there is some handlebar adjustment to be done). And that is another important point to cover. The extra-long handlebars provide an upright body position and dampen road vibration, but they also stick out quite a bit. This could make navigating between cars or through doorways a bit tricky. 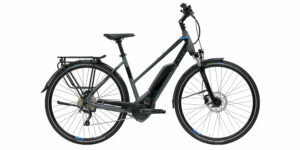 I have definitely scraped walls and door frames with ebikes similar to this one when walking bikes out of shops to do test rides. Sorry! Just keep this in mind and be careful. 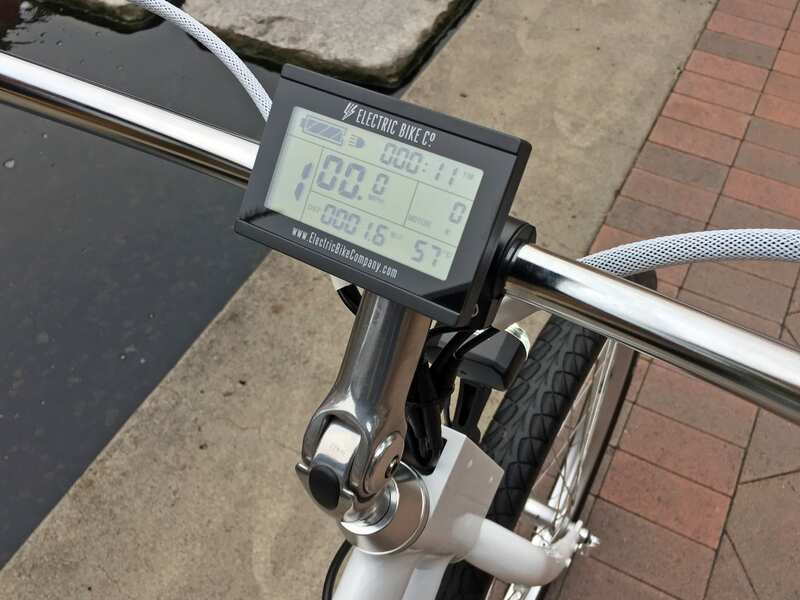 Powering these cruisers, their integrated LED lights, the backlit display panel, and an integrated USB port (below the display) is a 48 volt rack-mount battery. This pack comes in two sizes, and is actually rated higher than what EBC advertises… They call it 48 volts, but the display indicates nearly 52 volts. You can get a 10 amp hour or 16.8 amp hour configuration to increase your range, and both fit into the same rack space. 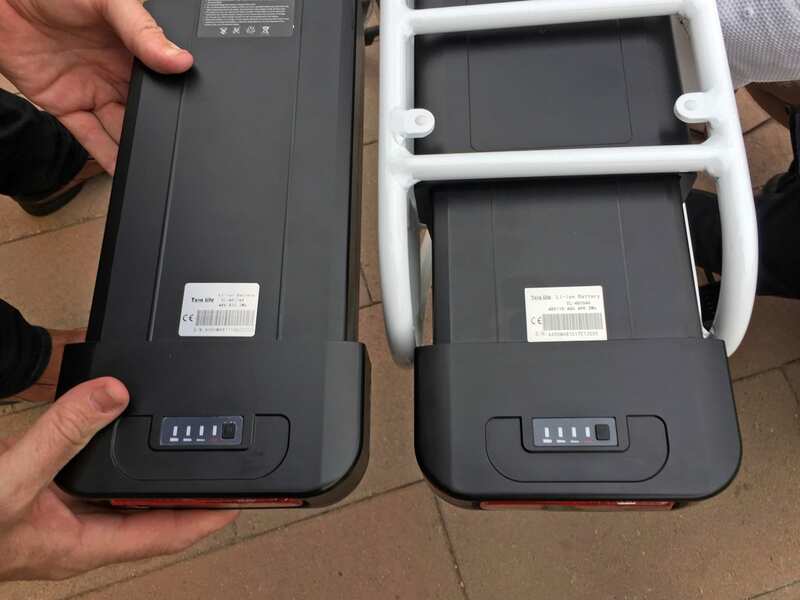 I’m guessing that they also both weigh about the same because the number of cells remains similar but the energy density of the higher capacity pack is just increased through more expensive cells which offer the latest technology. 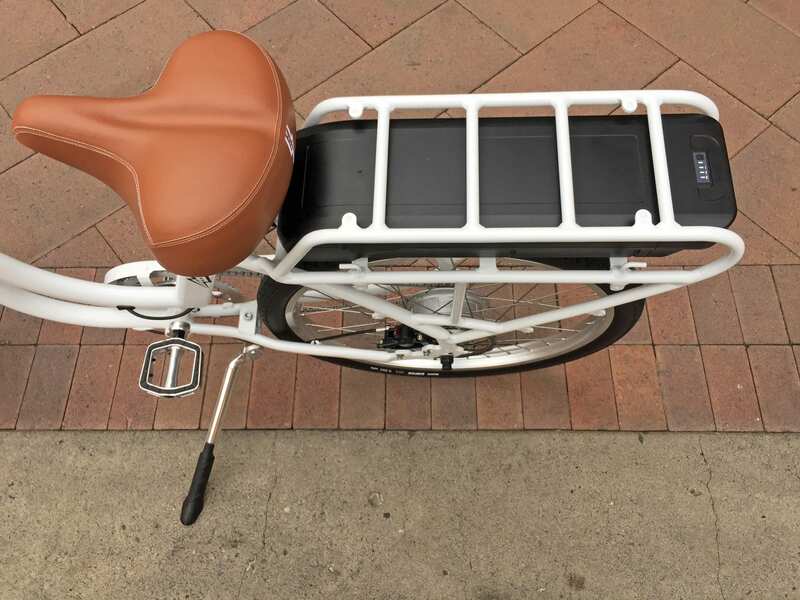 Speaking of tech… batteries are one area where the Electric Bike Company has really positioned itself as a leader. Apparently they have a tight partnership with a manufacturer which custom builds each battery to have individually fused cells along with two temperature sensors. I asked Sean about this, and he explained that they wanted to make the best battery on the market so that it could hold up to extreme environments… like what they might face in parts of South Africa. That makes sense! My own experience and learning has revealed that batteries last the longest and perform the best in cool, dry environments. You want to avoid extreme cold or heat, and keep the pack charged above 20% whenever possible because the Lithium-ion chemistry is most stable there. To make charging as reliable and easy as possible, the battery mounting dock in the rack has an integrated fan and retractable cord (like you might see on a vacuum cleaner). Whenever you stop for lunch or visit a friend’s house, just pull the cord and plug-in for a quick top-off. Yes, this does add some complexity and weight to the bike. But, it saves you the hassle of forgetting the charger at home. 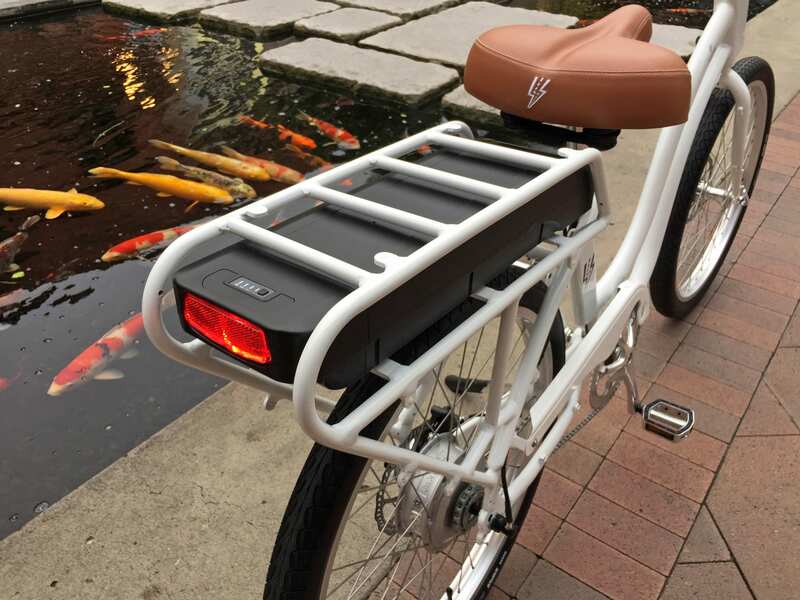 For those who cannot park near charging outlets or simply prefer to store the pack in a more stable environment (since the bike might not easily carry up stairs), they do offer a $99 portable fast charger that puts out more than twice the energy for even faster fills. The only real downside to all of this, is that the battery position is high and towards the back of the bike vs. low and center for optimal handling and stability. With such a rear-heavy design, these bikes do suffer from a bit of frame flex. 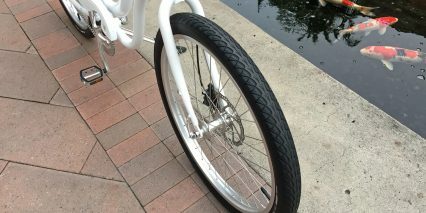 I did not experience speed wobble, the larger tires felt comfortable and stable, even when riding with no hands. 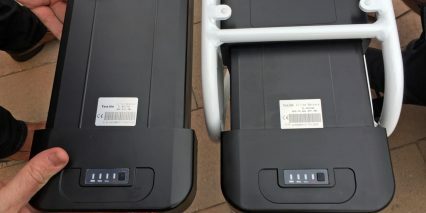 In order to have the batteries all be interchangeable and allow for the deep step-thru design of the Model S, the rear rack battery was chosen. Operating the bike is a bit of a trick. Simple, once you’ve learned all of the steps, but a little more involved than some. 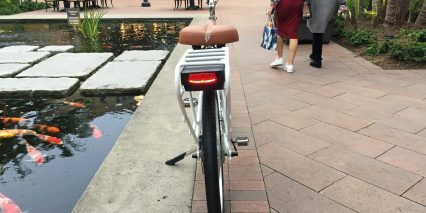 So, once the battery has been charged, mounted, and locked into the rear rack, you need to make sure the toggle switch on the bottom is set to on (the line, not the 0 symbol). 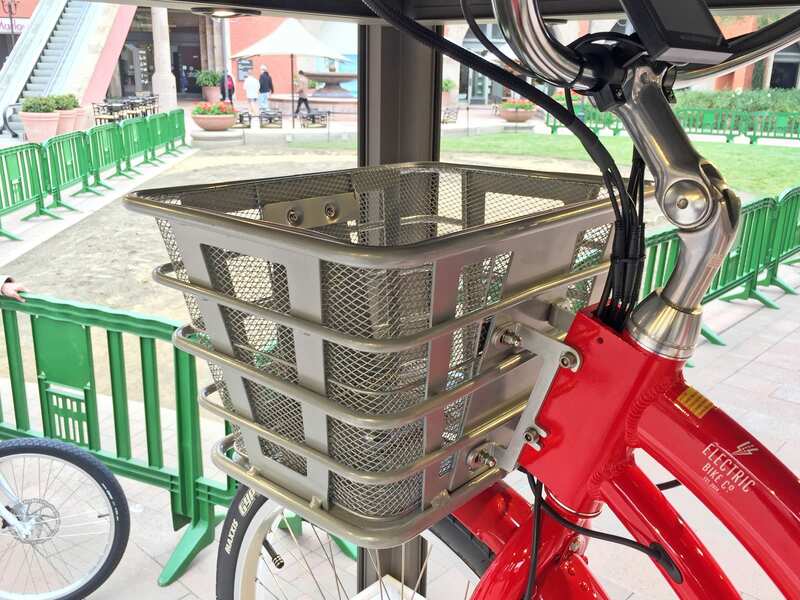 This is yet another safety feature, and a handy way to prevent tampering at bike racks. Next, you need to hold the center button on the control pad, which is mounted near the left grip. At this point, the display LCD boots up and your current speed, assist level (defaulted to 1), and some trip stats begin to show. At this point, the trigger throttle mounted near the right grip is active and offering full power. BE CAREFUL not to bump this trigger, or the bike will take off. You can use the little up and down arrows to raise or lower assist, but that doesn’t really do anything in throttle mode. You can click down to zero, and this will turn the throttle off, while leaving the display and lights accessible. You can activate the lights by holding the up arrow for a few seconds. This also turns on the LCD backlighting feature. And, as mentioned earlier, there is a full-sized USB port built into the backside of the LCD screen. 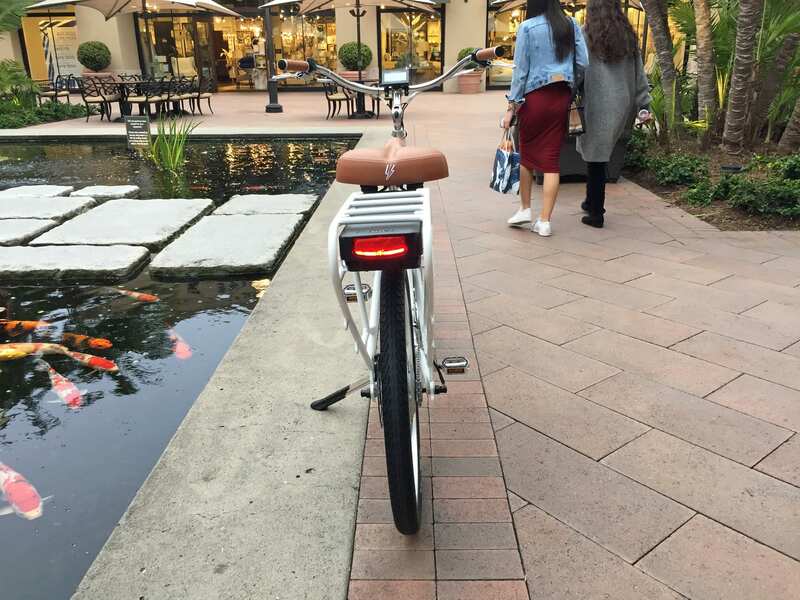 This is a great way to keep your phone charged while using GPS or run the portable Bluetooth speaker that the Electric Bike Company sells separately. Getting back to the different ride modes, you can hold the down arrow for a few seconds to switch from throttle mode to pedal assist + throttle. 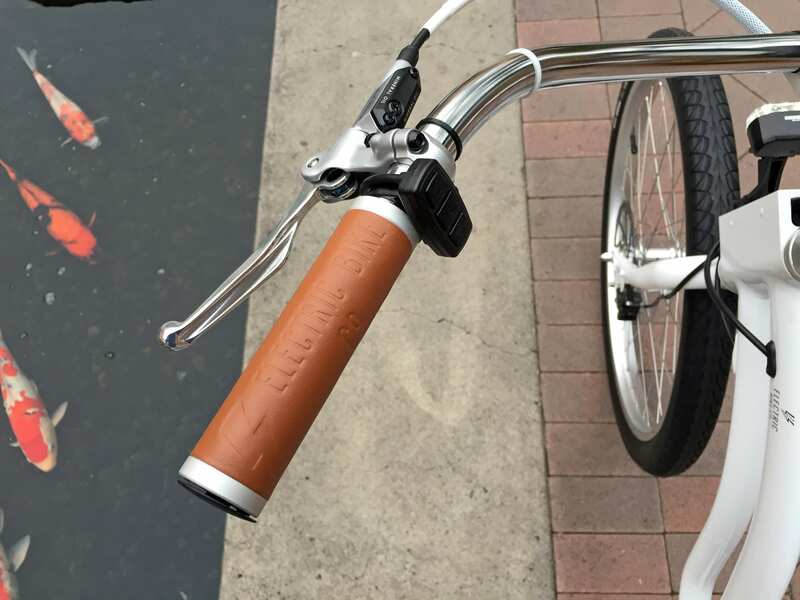 You will see a little text appear with the word “ASSIST” when this has been completed, and then the 8-magnet sensor located at the bottom bracket becomes active. I have used some higher-resolution 12-magnet sensors before, but eight isn’t too bad… the real limitation is only having one pedal gear. 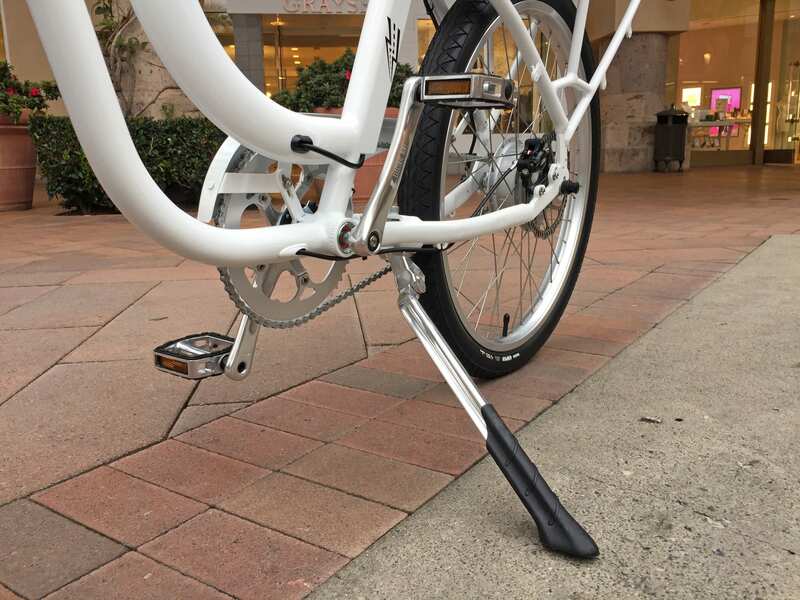 Without a low gear, it can really take some time to get the bike moving, and the sensors won’t pick up for a moment because the cranks are turning so slowly. This is where throttle override really comes in handy. 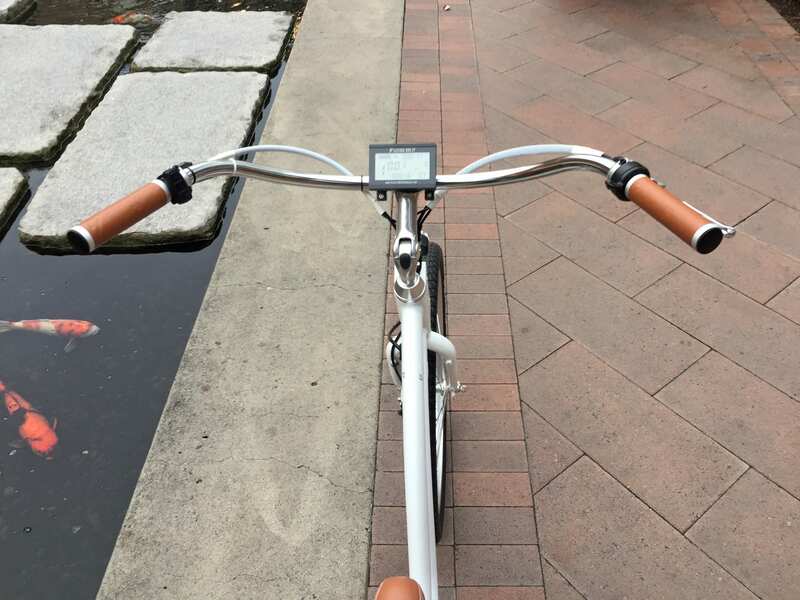 I found myself using the trigger throttle to get the bike moving at about five miles per hour, then switching to pedal assist so I could relax my thumb. By arrowing between assist level 1-5 I eventually found a comfortable support level that matched my pedal speed. At this point, the bike becomes a joy to ride. 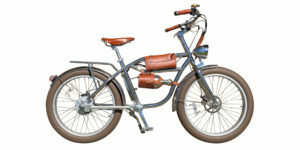 Even with the added weight of fenders, front basket, and cargo, the motor supports the bike easily. 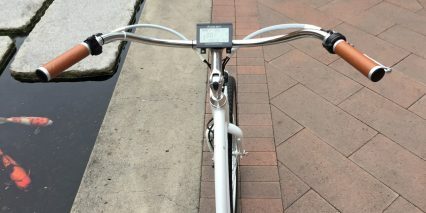 To enter into the settings and change units or lower the top speed of the bike, make sure the backlight is not on, and then hold the up and down arrows for a few seconds. Press the power button to confirm each menu and the up and down keys to make adjustments. There’s a lot to say about this product, and I’ll admit that the stability of the company over the past several years, the emphasis on global empowerment, and the well-chosen components and accessories has won me over. The final big factor to discuss here is braking, and that is handled very well also. 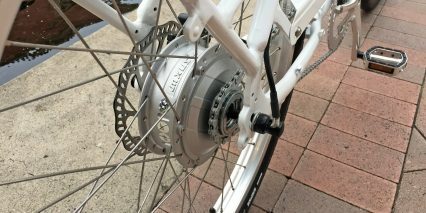 Electric Bike Company has opted for large 180 mm rotors with hydraulic brakes verses mechanical. This makes them much more consistent and easy to pull, especially for people with limited hand strength. Both levers have motor inhibitors that instantly cut power to the drive system when activated. It’s the right choice, and adds to the sense of control and durability. 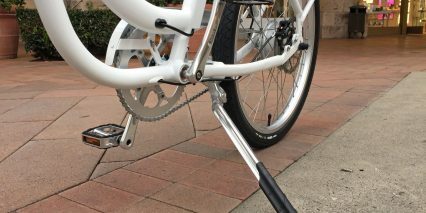 There are a few trade-offs here with the lack of bottle cage bosses, mid-mount kickstand that gets in the way of the left crank arm if left down, and protruding power cable from the right side of the hub motor, but overall the bike just works, and these are not unique issues to EBC. It’s interesting that pedal assist is not enabled by default here, but perhaps that makes the bike safer to approach? Trigger throttles are very intuitive and less easy to activate by mistake (compared to half-grip twist throttles). It’s still best-practice to leave the bike powered off, until you are mounted and ready to ride. I just love how low that saddle can go, and appreciate how comfortable the bike felt, even without a suspension fork. 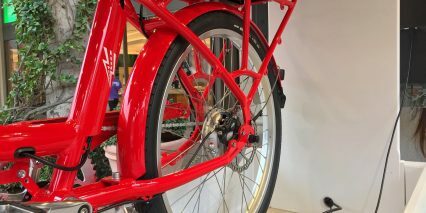 Steel offers some vibration dampening qualities as well as durability… the chain cover and fenders are sturdy, but could rust if you get scratches over time. I have heard that some owners use car touch-up paint or even fingernail polish. 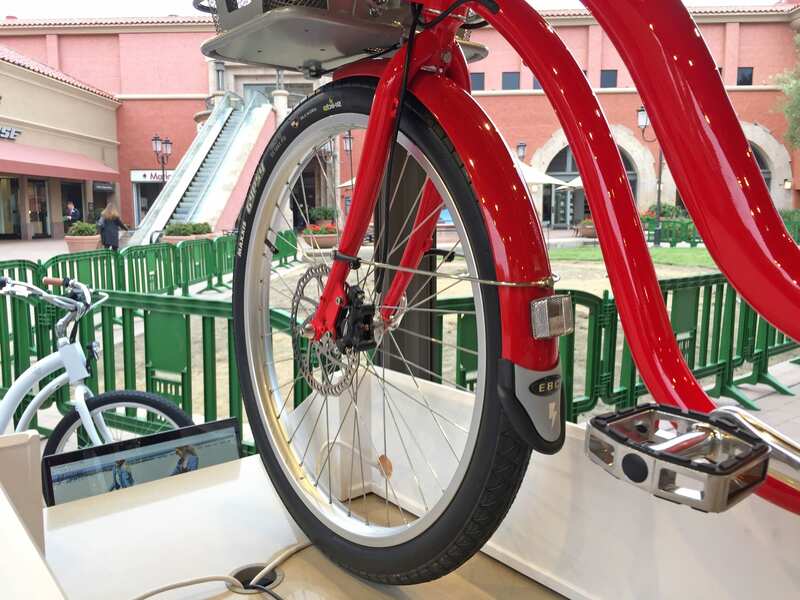 Finally, you get a wireless remote with the bike that activates a motion sensor on the bike and triggers a siren (like a car alarm) when bumped. I’m not sure exactly how practical it is vs. annoying, but it’s up to you to arm and it might be a real handy feature in some neighborhoods, to keep you aware of your investment. 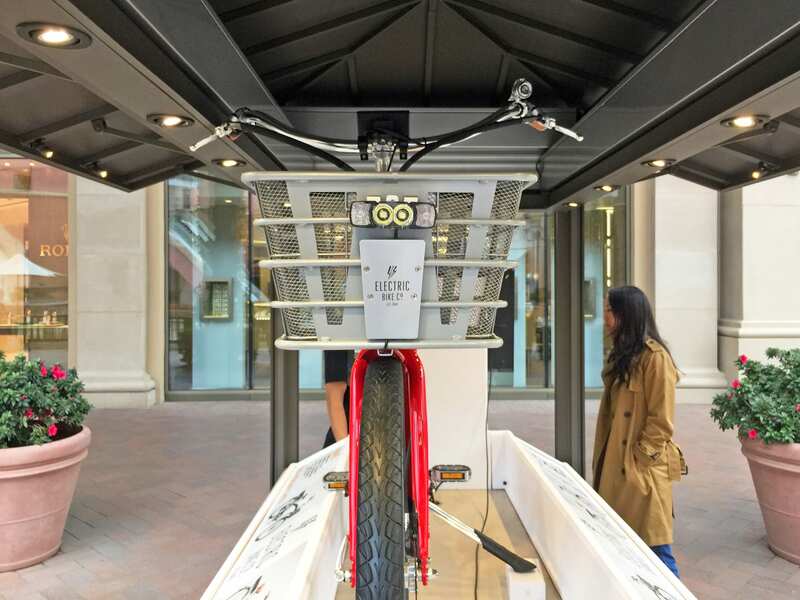 Again, perhaps this is a feature that fits life in different countries where the bike might actually be used as a daily transport and represent a higher proportion of income to its owner. I do appreciate how nicely the wires and cables are organized at the head tube and that they are internally routed for protection and aesthetics. 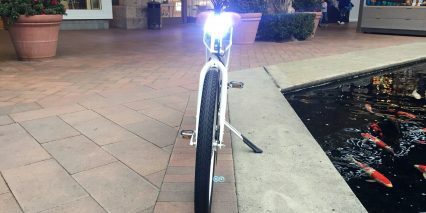 My personal choice of color would probably be white, to stay extra visible in low-light conditions… and I would love to see reflective tires at some point (though this may be non-allowable for a Class 3 ebike in parts of Europe). I’m excited to see where this company goes and want to thank the founder, Sean, for meeting with me and partnering with me on this review. I’ll do my best to answer any questions that come up and welcome you to chime in with feedback or post your stories and pictures in the forums. 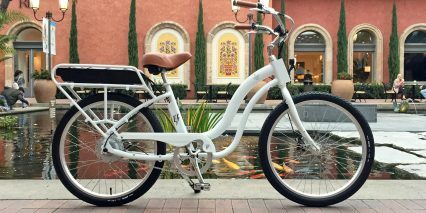 This ebike is a great example of a hub drive product that can be just as much fun as many mid-drives albeit for a much lower price point. Plenty of power, and the realization that you truly don’t need so many gears (single speed) to go as fast as you want or climb hills, with a demonstrably powerful hub drive. The 5 year warranty makes it that much more compelling, and a nearly half the price of other on-line brands that offer 1 to 4 year warranties. 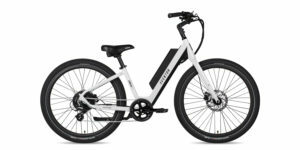 Awesome to see yet another company offering an ebike priced below or around $2000, and not attempting to push the over-hyped mid drive onto the consumer. As sales wane on mid-drives and those OEM’s keep having bloated inventories, it would not surprise to see many more firms come onto the scene with more affordably priced hub drives in the next few years. Sales and interest in e-bikes are very near the inflection point on the ‘hockey stick’ growth curve here in the US. 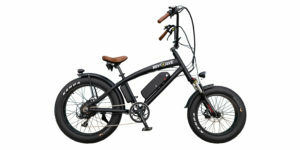 With brands like Electric Bike Co., opening the door for so many more consumer budgets, that curve should explode much higher by 2020, if not before, proving that you just don’t need to spend $3000 to $6000 to get a high quality, good performing ebike for general purpose riding. 95% of the US biking population is general purpose, not specialty or high performance, yet ironically the ratio of ebikes for those categories is nearly the opposite with most models available being specialty like MTB, off-road, fat tire, Cargo, or ‘high performance’. 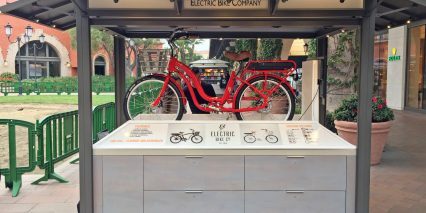 Kudos to Electric Bike Co. ! I love the clean look of this bike which is furthered by the single speed configuration. 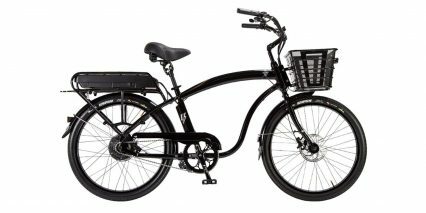 I’m wondering why e-bike manufacturers have largely shunned belt drives. 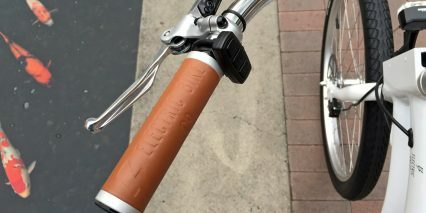 I have one on my priority bike and love the smooth operation and zero noise. 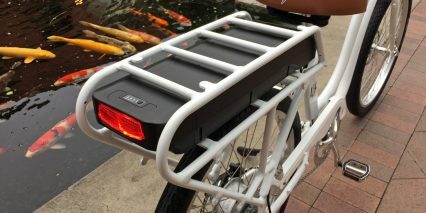 There’s some discussion in the forums here and the consensus appears to be that as e-bikes mature, there will be additional models with this feature. Hi Scott! I agree, belt drives can be very reliable, quiet, and clean! The big challenge is designing a frame that will work with them. You cannot unlink a belt to get it onto a frame the way that you can with a traditional chain. Instead, you need a cut-away portion of the frame that can be unscrewed and opened for a moment while the belt is fitted. This adds a lot of expense and can compromise frame integrity unless proper materials are used and testing is done. 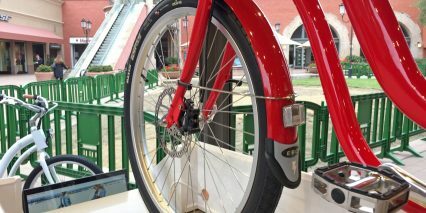 One company, called Riese & Müller, has designed most of their ebikes to have a wheel mount position that does not require the chain or belt to go above the chain stay. 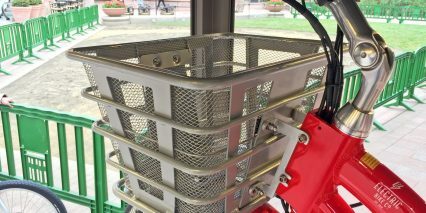 You can see it in action here, notice how the dropout sort of hangs down and the belt is below the frame tubing? 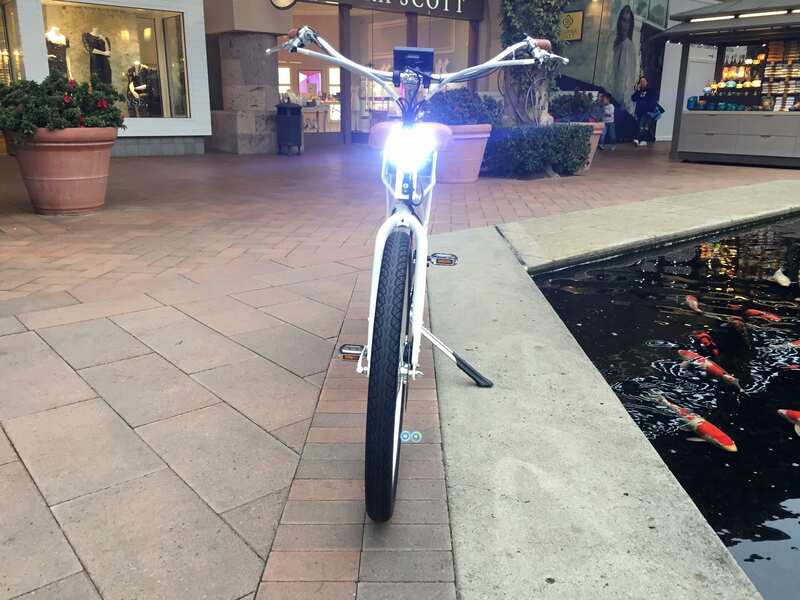 After looking at many excellent reviews, it looks like this and the Cross Current S are the only two speed pedelic bikes that have a 850+wh battery, fenders and integrated rack/lights for under 3k shipped including taxes/fees. Both are excellent looking bikes that appear to be great daily commuters! I currently have a Prodecotech Phantom X2 and am looking for a bike with more range / speed. (Phantom is throttle only, and at full throttle has a range of 12-15 miles with gear while going through hills.) I probably won’t go with a step through frame as I try and maintain the top speed the duration of my trip as the goal is exercise and a quicker commute. I weigh 165 and carry around 20lbs of gear with me at all times. If you were to pick a daily commuter between these two (or a 3rd option if I missed any) for a 20-22 mile round trip commute with fenders, rack, lights that was a speed pedelic; which would you go with? Thanks!! Hey Court, I ended up getting this bike yesterday after watching your review. Such a feature rich bike at a great price. I’ve been researching for months and deciding between this, the Magnum Cruiser, and the Electra Townie; ultimately this one won out. 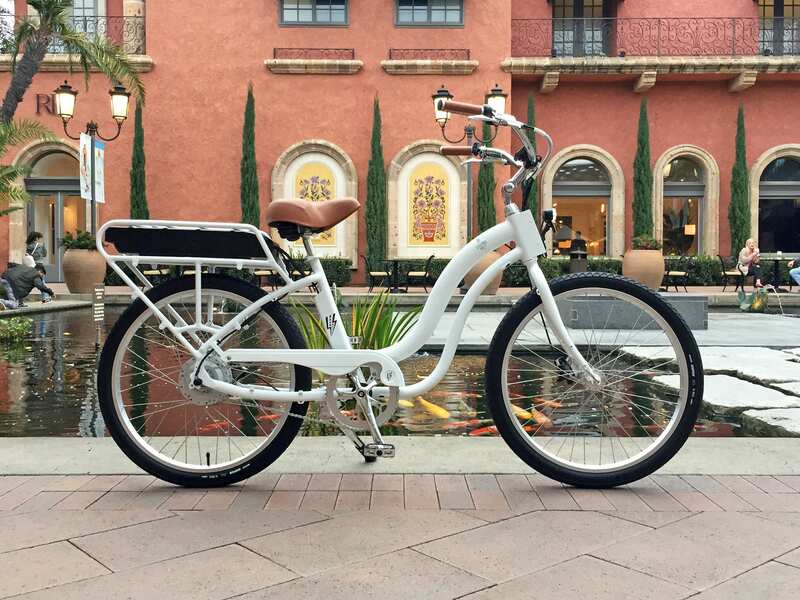 It has great styling, large battery size with rear placement, and the 28mph speed. The integrated light, theft alarm, and throttle all contributed to pushing this to the top of my list. Thank you for giving such detailed descriptions of these bikes. Awesome! It sounds like the timing was just right for publishing the review :D thanks for sharing what you liked about it, and I’d invite you back to share more once you receive and ride the bike some. 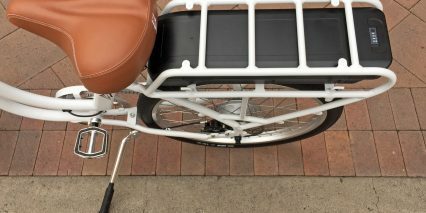 You could comment here or leave a longer post with pictures and stuff in the new Electric Bike Company forums. 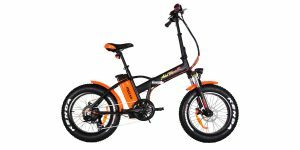 Hi Court, I have been watching many reviews that you have on electric bikes. Now I have learned much from these, however I was wondering if you could give me a little more advise. 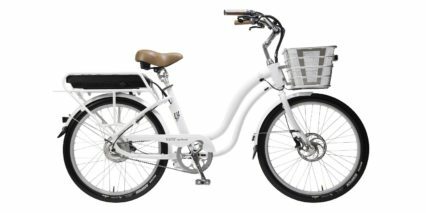 I have pretty much narrowed it down to either the Electra Townie Go 8i or the Electric Bike Company Model S. Both are within my budget, but are still a major purchase for me… I have gone to the local bike shop and did a test ride of the Go. Most other mail order bikes are ruled out due to assembly whereas the Model S is pretty much assembled and tuned. I really like the many options and accessories offered with the Model S, especially since I will probably take my 18 lb dog with me at times. My main concern is the difference in drive systems. I am 63 and haven’t ridden in more than 25 years. I recently had surgery to lose weight. I promised myself that I would get a bike and become more active. Well, the hills and gravel roads around me put a quick stop to enjoying the ride. I want to be active but not necessarily feel like I’ve been to the gym. I would ride on mostly hilly terrain on gravel roads, paved or at least well maintained bike trails etc. I don’t want to have to walk my bike up hills or die trying to pedal it up. I am sure I will get stronger as time goes on but consistent riding is a problem when I get no enjoyment from the ride. Can you give me some insight? I noticed that the price listed is about $1900, but on the website it appears to be $2300. Did they recently increase their price by $400? Hmm, I’m not sure on this Joe. Some companies have had to increase based on the international tariffs. 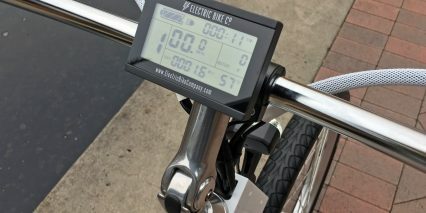 Perhaps the Electric Bike Company has updated their product with new parts that cost more? I cannot really say, but you could reach out to them directly and probably get more feedback on this. My reviews are sort of a shapshot in time, but the bikes and prices do often change a bit as time moves on. I reached out to them, they did increase prices I believe due to the new international tariffs, but can’t confirm on that. 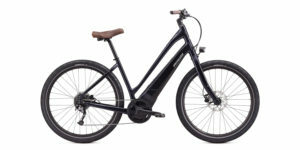 I just ordered a bike from The Electric Bike Company. 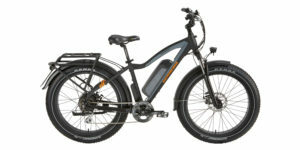 I researched electric bikes on the net for months, read reviews and watched videos. I am 70 years old, and have had some medical issues. I got down to a recumbent and the Electric Bike Company model. Then, I receive a call from the Electric Bike Co. sales manager and she answered all my questions. She was so helpful and knowledgeable. I can’t wait till I receive my bike. I know I will love it. In my opinion, you cannot go wrong with this company. I see a section for coupon codes when I go to order the bike. Would anyone know any of the codes? Hi Tony! 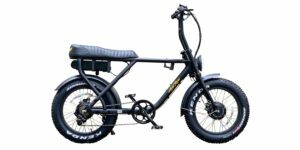 I don’t know of any, but perhaps you could ask around in the Electric Bike Co Forums, or just ask the company directly if they have any?